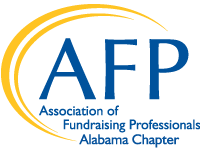 The Association of Fundraising Professionals (AFP) Alabama Chapter holds National Philanthropy Day each year to recognize outstanding achievements by individuals, foundation and corporate philanthropists, fundraising volunteers, and professional fundraising executives across the wonderful state of Alabama. An original hand-forged iron statuette made by a local artist. Four (4) complimentary tickets to the event, with the opportunity to purchase additional tickets at a discounted member rate ($35). An opportunity to share their story and philanthropy journey through the official National Philanthropy Day video. An opportunity to make remarks from the stage at the National Philanthropy Day event. A lifelong memory of being honored on National Philanthropy Day. The honor of joining a slate of amazing philanthropists who have been honored as award winners since 1982. Please review all nominations instructions prior to submitting your nomination. All nominations must be submitted no later than June 7th, 2019. Any person from the community may submit a nomination. No more than two (2) organizations can nominate the same individual jointly. Award winners must be present to accept their award at the event on Thursday, November 14th, 2019. Awards selection will take place in mid-July, and nominators will be informed if their nominee was selected. Previously submitted nominations will not be carried forward. If you have previously put forward a nomination and would like the same nominee to be considered for 2019, you must submit a new application for the current year. Past honorees cannot be nominated for the same award; however, an honoree may be nominated for a different award. Click here for a full list of past honorees in each category. One (1) professional hi-resolution head shot of awardee(s). Five (5) supporting pictures of the awardee(s) working with their organization/community. Assistance with scheduling nominee to appear in the National Philanthropy Day Awards Video. This award is presented to an individual, couple, or family demonstrating exceptional financial generosity to charitable organizations and causes in Alabama. Nominees should not only have played a key role in assisting organizations in achieving their financial goals, but also set an example for others to follow. This award honors the individual, couple, or family who has demonstrated exceptional leadership in community projects or major fundraising campaigns benefiting a charitable organization. Nominees should also exhibit organizational skills as well as the ability to recruit and motivate others to support philanthropic causes. This award recognizes a business or company that has provided direct financial, in-kind, or volunteer support to nonprofit organizations and charitable projects in Alabama. Exceptional nominees will be diversified in their service to the nonprofit sector, often taking leadership roles and encouraging involvement by other businesses. Professional advisors play a key role in connecting philanthropic individuals to community needs by helping them meet their personal charitable giving goals. Candidates should support philanthropy in their work by facilitating significant gifts to local charities as well as personally by giving time, talent, charitable contributions, and leadership among fellow professionals. Eligibility is limited to candidates representing high professional standards in one of the following fields: law, accounting, insurance, financial planning, banking, or investment services. This award is presented to a fundraising professional demonstrating commitment to the profession, knowledge of the industry, and leadership capabilities. The individual will also exemplify the ethics and standards set forth by AFP. Nominees should have a track record of service and advancing philanthropy in their workplace and the greater community. AFP members in good standing are highly preferred. Many civic organizations, foundations, nonprofit agencies, and service groups serve our communities and advance causes vital to our quality of life. This award is presented to a highly visible champion of existing causes, special projects, or new initiatives. This award recognizes that today’s youth play a major role in changing the world. Young people can make a difference and are the future of philanthropy. Eligible nominees are individuals between the ages of 12 and 25 or a group (sororities, fraternities, college athletic teams, etc.) who demonstrate philanthropy through service, volunteering and/or fundraising, and serve as an example for others.